Legs Swelling These veins are called spider veins because of the “webbing” appearance they have. They are dilated small veins, close to the surface level of the skin, no greater than 2 millimeters in diameter and appearing in a range of hues from red to blue. They mainly occur in the legs, although they can also occur on the face, especially on the nose. They can be embarrassing and ugly, but they are generally not painful or at most cause occasional aching, burning or irritability. Spider veins do not usually pose a risk to patient’s health. 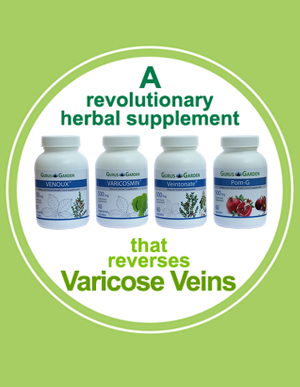 Varicose veins, typically 6mms in diameter or more, are subcutaneous [beneath the skin] blueish blood vessels that – in most cases – extend from the main trunk veins. 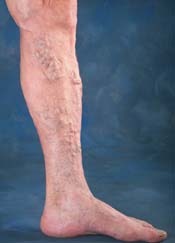 Increased blood pressure in the main trunk veins, such as the Great Saphenous vein, will contribute to their occurrence. Like spider veins, they can be unpleasant, ugly and painful. 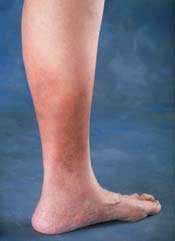 For example, inflammation known as phlebitis can cause the skin above the vein to redden and burn. Meanwhile, a host of other symptoms can result: these can manifest as a general bodily fatigue or as more ‘leg-centred’ problems of agitation, weightiness, throbbing / pulsing, cramping, and itchiness. Left untreated, venous reflux can progress to other conditions. Legs Swelling Venous reflux disease is a progressive condition that can become a serious issue, with its ramifications extending beyond the unsightliness of varicose veins and their associated discomforts. 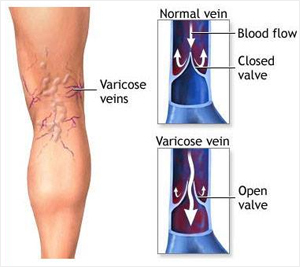 As the condition worsens, it can lead to leg swelling, a clear indicator that venous valves have become diseased or damaged. The inefficient transfer of blood back to the heart causes blood pooling in the leg, leading to fluid retention called oedema, and venous hypertension (abnormally high blood pressure in the veins). Skin Changes Another complication of abnormally high blood pressure in the leg, and the improper flow of blood through the perforating and superficial veins, is skin damage. Hyperpigmentation, or an abnormal alteration of skin colour, will result as the venous reflux condition becomes more advanced, while change or deterioration in the consistency of the skin is also likely. 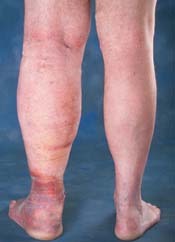 Leg Ulcers Venous ulcers are recognized as the most serious phase of the venous reflux condition. 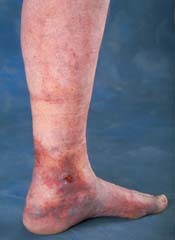 Another symptom of insufficient blood flow, these wounds typically appear beside the ankle. They result from the perforator vein malfunction associated with venous reflux. These ulcers are malodorous, painful and socially isolating. They require long-term bandaging as well as the use of local medicated creams, and occasionally other treatments such as antibiotics. They may be very slow to heal, or indeed fail to heal. It is important that all patients with leg ulcers are adequately medically assessed to out rule other causes of leg ulceration, such as arterial disease. 1. Endovenous Laser Therapy – Endovenous laser treatment is used to close off a larger varicose vein, instead of using surgery to remove it. 2. Sclerotherapy – Sclerotherapy is a medical procedure used to eliminate varicose veins and spider veins. Sclerotherapy involves an injection of a solution (generally a salt solution) directly into the vein. The solution irritates the lining of the blood vessel, causing it to swell and stick together, and the blood to clot. 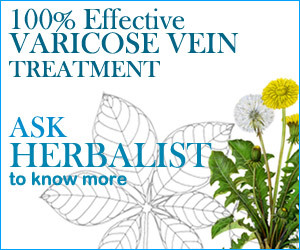 We, Chavarcode Ayurveda Physicians offer you our proprietary blend of Ayurvedic medicines which is time tested for more than a century for curing / reversing the varicose vein. Who are we? – Chavarcode Ayurveda Vaidya Family is one of the most renowned ones for its great tradition in India’s ancient and holistic system of treatment since 1865: The family proudly and carefully preserves very valuable and age old manuscripts in Ayurveda, which are inherited from their sagely predecessors. The Chavarcode Physicians were and are sincerely engaged in the research for the treatment of many chronic and incurable diseases. The secret and proprietary medicines formulated and prepared by the Chavarcode Vaidya Family have been found to be of proved efficacy, that the patients, who have been under frustration after having had the modern methods of treatments, have gained absolute solace. Our medicines are marketed worldwide from our US office since 1993. We guarantee you that you will find a difference in the intensity of the pain and discomfort within 15 days of using our medicines. Generally the period of treatment is 6-9 months for best result.